In today’s Sunday Business Post, our CEO Sue Marshall speaks with Colette Sexton about the increasing demand for remote and smart working across companies and countries. They also discuss our €300K investment into V2 of our smart matching careers platform and why we’re looking to raise between €6-10 Million in VC funding in the next few months to expand our existing markets from Ireland and the UK, into the US. 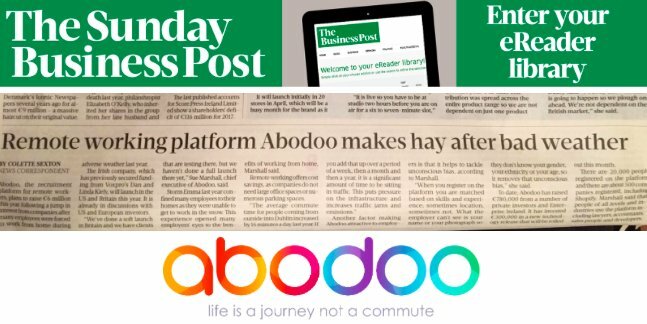 “With over 20,000 members in less than 1 year, actively seeking flexible options, we know this is the future and as more companies realise the numerous benefits associated with SmartWorking and flexibility, the greater communities will grow globally” Sue Marshall, CEO Abodoo.com. If you’re looking for a career that offers flexibility in location, register on Abodoo.com to get matched with your dream job! If you’re a company that offers flexibility in location, simply post your job on Abodoo.com Company and access a whole new talent pool and pipeline of skilled professionals!